Why just create a souvenir building when it can serve another function? Souvenir buildings come in many forms, paperweights, thermometers, ink wells and pencil sharpeners. 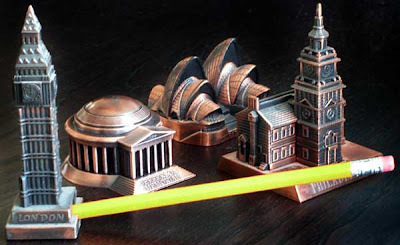 Newer sharpeners are usually made of cheaper-quality metal, but the detail is good and you can’t beat the prices.This site, Aj's pencil sharpeners, offers many different pencil sharpeners and quite a few metal buildings and metal monument replicas. There has been a tradition of building replica / sharpener combinations. Empire State and Chrysler buildings were cast as lead pencil sharpeners in the 1930’s.